Stems: Prostrate, decumbent, ascending, or erect, slender, weakly 4-angled, glabrous or soft hairy. Leaves: Opposite, simple, stalked, ovate, lanceolate or oblong, 1 to 4 inches long, .25 to 1.5 inch wide, glabrous or sparsely hairy; margins entire to somewhat toothed; tips blunt to pointed. 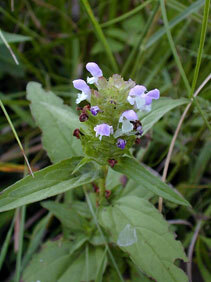 Inflorescences: Dense spikes, 1 to 3 inches tall, terminal; flowers in whorl-like clusters, 3 flowers in axil of each bract; bracts kidney-shaped, 1/4 to 1/2 inch long; margins entire; tips abruptly pointed. Flowers: Calyces narrowly bell-shaped, green or purple, deeply 2-lipped, upper lip shallowly 3-lobed, lower lip 2-lobed, lobes sharp-pointed; corollas 2-lipped, purple, lavender, or occasionally white; upper lip resembling a spoon; lower lip much shorter than upper, 3-lobed, middle lobe fringed; stamens 4, in 2 pairs. Fruits: 4 nutlets, egg-shaped, slightly flat, smooth, yellowish-brown, each 1-seeded. Habitat: Shaded areas with wet soils, woods, thickets, stream banks, pond and lake edges, waste ground, and lawns. Uses: Native Americans steeped the foliage and roots and used the liquid as a wash for burns, cuts, eye soreness, fevers, acne, and to treat saddle sores on horses. They also took a tea made from the plant for stomachaches and diarrhea. The leaves sometimes were used as food. Comments: Self-heal is an introduced species.